On the day the Giro d’Italia gets underway with the timetrial in Belfast, here are 25 facts about the world’s second largest road race. 4. The Giro d'Italia is considered part of the "Triple Crown of Cycling", along with the Tour de France and the World Championships. 6. The cyclists will travel a gruelling 426.7 km during three days of competition in Ireland. 8. 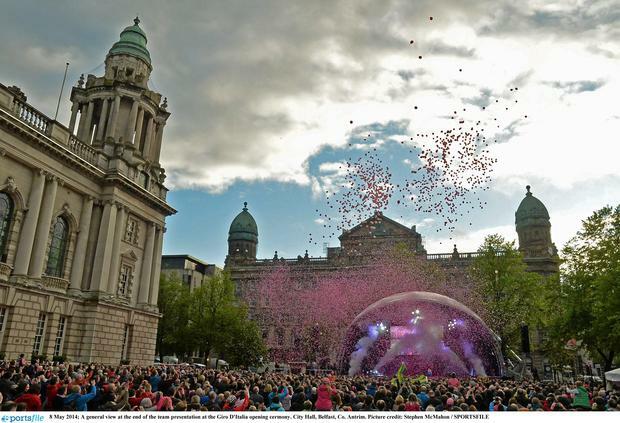 Belfast City Hall and Ulster Hall will illuminate pink for the event. Hundreds of businesses are planning to go pink to celebrate Giro – from tractors to buildings and confectionery to fish and chips. 9. A GIANT pink Giro jersey will be laid on the Dunluce Castle site as the cyclists make their way along the Causeway Coastal Route. 18. It wasn't until Stephen Roche's win in 1987 that an English speaker took top honours.